First line throw-in where connection is not sente. Later, - is sente (1.00). Later, - is an ambiguous sequence (0.67). 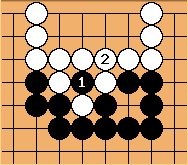 The marked white stone doesn't really matter (see BQM 127). Bill: It follows my suggestion on the main page: Please show territory unambiguously. I. e., close it off. Later, - is a 1-point ambiguous exchange. 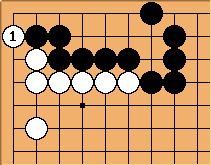 Later, White has an ambiguous play (1.00) at a. Taking at a is 0.5 point worse. Next play is worth 1.42. Next play is worth 0.33. Next play is worth 1.50. After , - is sente (1.00). Next play here (capture, for both sides) is worth 4/3. See Miai Values List / 2.00 and more for higher values.